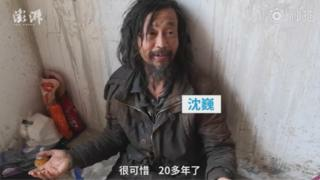 A homeless man in China has become famous online for being "a master of Guoxue" - the study of Chinese literature. Shen Wei, who's from Shanghai, has lived the life of a wanderer for more than a decade. However, recent videos of him quoting Confucius, and discussing the merits of the 16th-century work Liao Fan's Four Lessons, seem to have surprised people because of his circumstances. These have received millions of views. One clip, which appeared on the official China News Service, shows him being surrounded by a crowd of people in the street, many with their phones out to take pictures of him. But speaking of his new-found fame, Shen says: "I don't want to be famous and I like a quiet life." "I'm getting old and know my destiny," he's quoted by the ECNS news agency as saying. Shen was apparently once a civil servant at an audit office in Shanghai. Chinese authorities are said to have confirmed that an employee named Shen Wei has been taking sick leave for 26 years because of illness, but still receives "payments", ECNS reports. For the last 48 hours, Shen has been one of the top ten talking points on China's Twitter-like platform Sina Weibo. The Chinese news site The Paper also reports online influencers are hoping that appearing with Shen will gain them more views. Hashtags relating to Shen have racked up tens of thousands of views. #ShanghaiXuhuiAuditBureauRespondsToFamousWanderer has been used more than 50,000 times so far. Weibo users are widely debating his life, and there's a lot of discussion about whether he was let down by the welfare system. "It's Shanghai's shame that he's not been looked after," read one comment. Shen explains that he grew up in a "tough environment" and in order to study he would collect waste "such as orange peels and broken glass" and sell them to earn money to buy books, ECNS reports. The habit of collecting rubbish has stayed with him, and some reports say Shen spends his days sorting the rubbish he collects, reading, drawing and caring for stray cats. He's been on the streets, living this life after being evicted from a his flat in 2002, the South China Morning Post reports. However, as an admirer of Gandhi, Shen says he is "willing to live a hard life" and likes the lifestyle. On Weibo, people have been praising him: One user said: "I admire this old man who lives by his heart. Any society that has someone who insists on creating themselves, not disguising themselves, and not compromising themselves - this is news." Being environmentally friendly and living a simple life is a huge driver for Shen, and it is something he hopes other people will adopt. "For so many years, the principle I have been holding to is that people should not waste things unscrupulously," he says, according to ECNS.